The occasional warm sunny day. Planes lumbering and whining overhead as they climb and bank away from Heathrow. Rugby crowds done for another season. All of this means that summer (if we get one) is not too far away and that Twickenham Festival is back! Huzzah! The official festival guide can be found in local shops and cafes as well as online. Here at Twickerati we don’t bother to plagiarise all of that information, merely selected highlights. 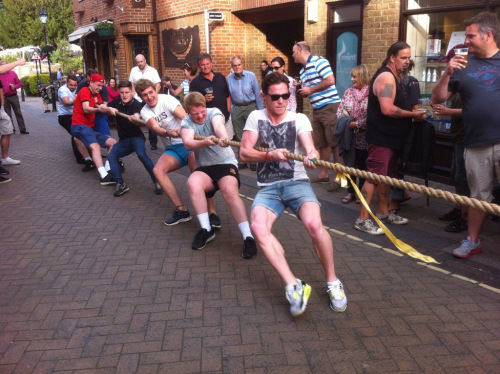 As is the way of things, #TwickFest 2018 gets off to a tugging good start with the Tug of War competition in Church Street. Teams of eight battle it out for supremacy and the bragging rights associated with being the borough’s top tuggers. The Mayor usually has a hand in things too. When does it all start? 6.30pm on Friday 8th June, that’s bloody when! If the tug of war involves too much grunting and groaning for your tender ears then you could always opt for an evening of choral music from the Serafine Chamber Choir at All Hallows Church instead. Tickets £12 on the door or online. 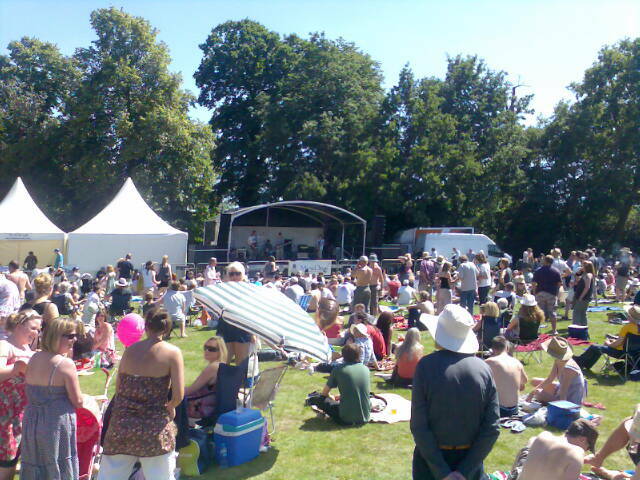 In fact there are other concerts there too over the weekend as part of a small music festival. In fact (again) there is a range of gigs taking place over the next few weeks including at Twickenham Jazz Club, TwickFolk and the Eel Pie Club for all your authentic British R&B requirements. On Saturday 9th, there’s a ‘Wizard of Oz’ Summer Fair at St Mary’s church featuring a yellow brick road trail for the small ones and a barbecue, but for those of you wanting to try something new in the alcohol department (or just to kill an afternoon with your nose stuck in a glass) then Ricardo’s Cellar are hosting a summer wine tasting event at The Fox. It runs from 2.00 to 7.00pm and costs £10. Tickets from Ricardo’s Cellar in Church Street. The Borough’s Best Banger Competition returns on Sunday 10th. It’s all about the sausages, innit. The banger-fest takes place from 12.00 to 2.30pm in the Diamond Jubilee Gardens. Powerjam will be on hand to provide the music to augment your sausage sampling experience. (Discretion assured). On the same day there’s a Craft Market in Church Street with stalls, gifts, music and Morris dancers. Clog wearing is optional. On Tuesday 12th saxophonist Simon Spillett is at Twickenham Jazz Club at Patchworks, while Richmond Film Society will be hosting a special TwickFest screening of award winning indie movie The Florida Project at The Exchange. Slim Chance perform at The Eel Pie Club on Thursday 14th. On Saturday 16th and Sunday 17th Church Street Goes Green once more. The street will be (astro)turfed over and filled with plants, craft stalls, food stalls, places to sit and take a refreshing cup of tea in a kind of summer fete stylee. On that Saturday the inaugural Twickenham Record Fair takes place in St Mary’s Church Hall. Great for new vinyl collectors and also a chance for older ones to go all misty eyed at the prospect of picking up that rare pressing from Southern Death Cult on pink vinyl that’s been missing from your collection since Scouse Pete broke your signed copy at a party in 1985. Well, it might not be quite like that but since the guys from Eel Pie Records are organising it you can be damned sure it’ll be worth dropping in. Pope’s Grotto is also open on this weekend (and the following weekend) giving you a chance to see the subterranean curiosity built by Twickenham’s “man of letters” Alexander Pope. Saturday 16th is also the date for a summer barbecue with music at Radnor Gardens cafe (5.30 to 9.30pm) and also for a singalong party with Shelle Luscombe of Vocal Tonix at the ETNA centre community project in Rosslyn Road, St Margarets. (No previous singing experience necessary). On Wednesday 20th June there’s a jazz river cruise along the Thames but landlubbers might prefer Twickenham Cinema Club’s special screening of An Education starring Carey Mulligan based on the coming of age memoir by journalist Lynn Barber who grew up in the area. On the weekend of Friday 22nd to Sunday 24th June it’s the first of the two Art House Open Studios weekends. Local artists open their studios to the public. Great for art lovers and nosy people alike. It also takes place on 29th June to 1st July. The Art House website lists the many artists participating. Eel Pie Island artists will also be taking part on the Saturday and Sunday dates. Art, sculpture, prints and Pimms all on one handy island. Nice. Details here. This weekend also sees a continental market in Church Street. We’re not sure if it’s the French one, the Italian one or another one that’s just from “on the continent” as people used to say and probably will start doing so again in the near future. Just don’t drink the water, eh? “Woof woof!” “Who’s there?” “Twicker” “Twicker who?” “Twicker-nam Dog Show. It returns to the Diamond Jubilee Gardens on Saturday 23rd (2.00-4.00pm) for more canine comedy competitiveness. There are 10 fun categories meaning even the most muttliest of mutts has a chance of winning something. On Sunday 24th it’s the Crown Road Summer Fair from 11.00am. There’s always lots going on for this one with stalls running down the street, a bouncy castle, lots of food and drink and music. And it’s always sunny too! Yes really! And that, dear friends, is the last day of the festival. Worried that July means it’s all over? Worry not! 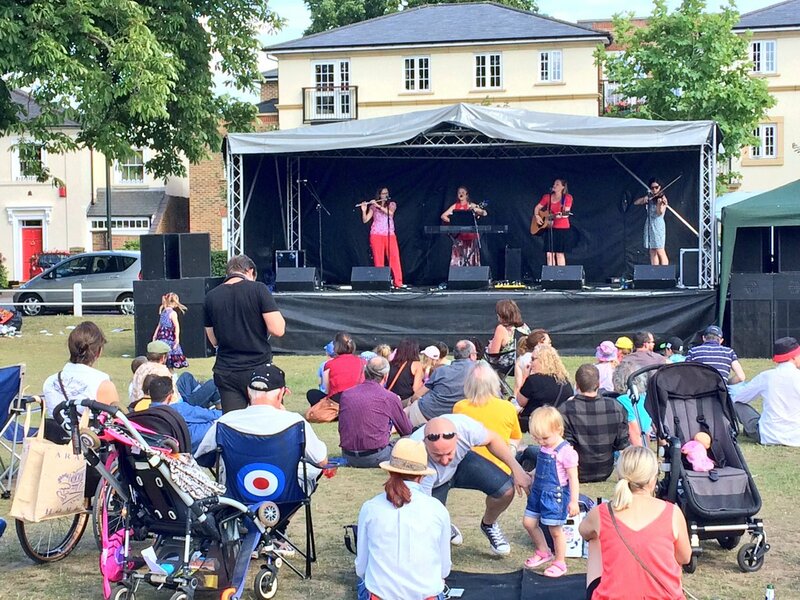 Sunday 1st July is the Twickenham Green Village Fete from 12.00pm to 8.00pm with all the usual fetey things and live music. Saturday 7th July is the St Margarets Fair in Moormead. 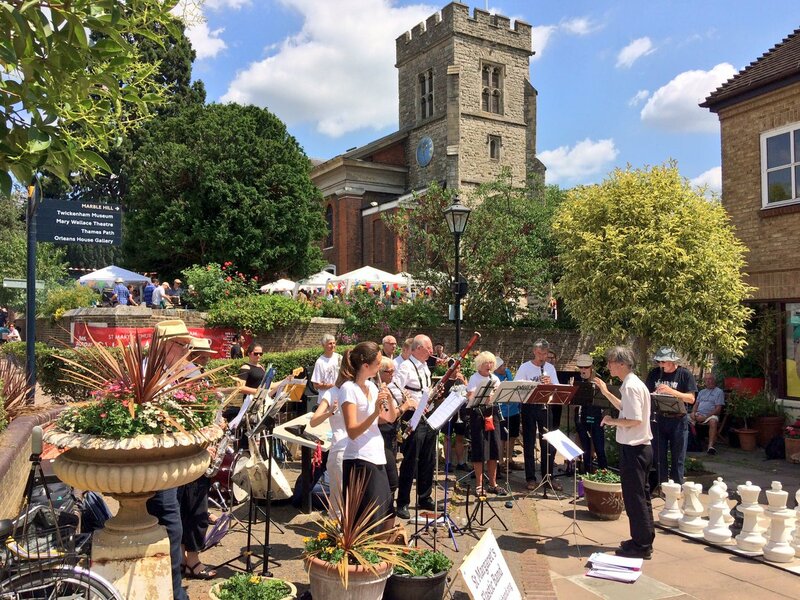 Music, food, beer, Pimms, entertainment for children are the drill for this one and on Sunday 29th July it’s the Strawberry Hill Music and Fun Day in the gardens of the house. Acts performing include The Mustangs, rock & rollers Nark Drool and the Shudders, and The Launchers. 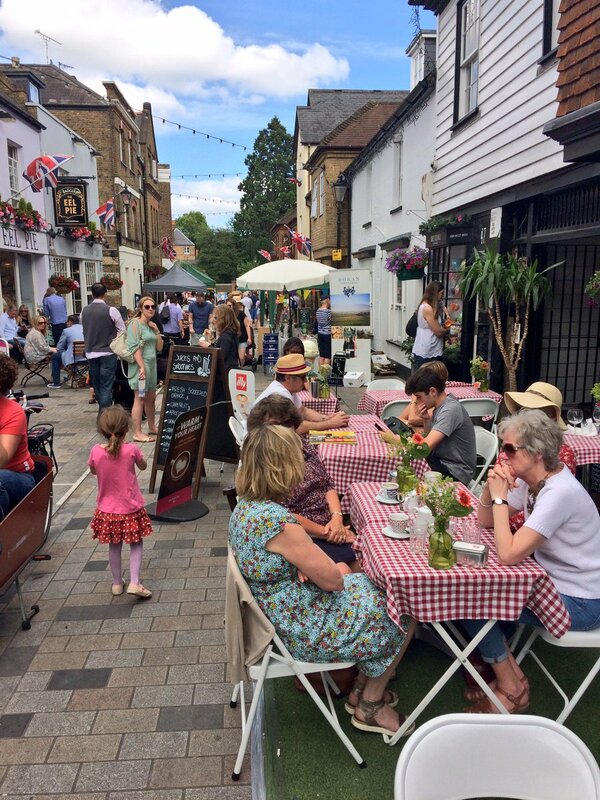 We’re nearly done now but in other ‘enjoying Twickenham’ related news, don’t forget that al fresco dining in Church Street is already back for the summer so that you can enjoy outdoor eating on Thursday, Friday and Saturday evenings. Feeling skint? No worries. Just take your own picnic and sit by the river! And talking of picnics don’t forget there there are the usual array of outdoor concerts at Hampton Pool, Kew Gardens and Hampton Court Palace taking place in the weeks ahead. Oh, and don’t forget that the annual outdoor production by the Richmond Shakespeare Society takes place in York House Gardens between the 16th and 21st July. This year it’s Shaky’s A Midsummer Night’s Dream. More info here. That’s all for now. We’ll add to this item over the next few weeks. It’s your town. It’s your festival. The Borough’s Best Banger competition on Sunday 10th June is a great way to support the independent butchers in the Borough. Takes place on Twickenham riverside from midday. Free event all you have to do is try all the sausages and vote for a winner.